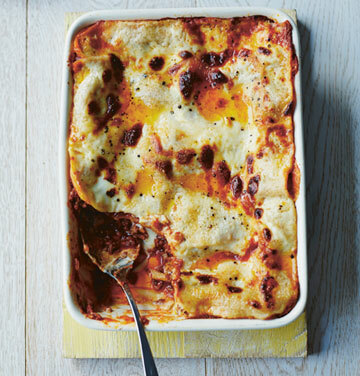 This recipe has been handed down in the D’Acampo family for many generations, though I call it ‘Lasagne di Mamma’ because my mother taught it to my sister and me when we were about 11 years old. It’s a great tradition that my wife will pass on to our own children. Allowing the dish to rest for a good 10 minutes before serving allows the layers to firm up slightly and become easier to cut neatly. Pour in the wine, stir well and cook for 5 minutes until the alcohol has evaporated. Add the passata, tomato purée and basil, then lower the heat and cook, uncovered, for 1 hour, stirring occasionally, until you get a beautiful rich sauce. Taste and season after about 30 minutes. Spread half the meat sauce over the pasta, then top with a third of the remaining béchamel sauce. Lay 4 more sheets of lasagne on top and cover with the remaining meat sauce. Spread half the remaining béchamel sauce on top. Arrange a final layer of lasagne sheets over the sauces, then gently spread the rest of the béchamel on top, making sure that you completely cover the pasta. Cook in the bottom of the oven for 30 minutes, then place the dish in the middle of the oven, raise the temperature to 200°C/gas mark 6 and cook for a further 15 minutes until golden and crispy all over. Set the dish aside to rest for 10 minutes before serving. 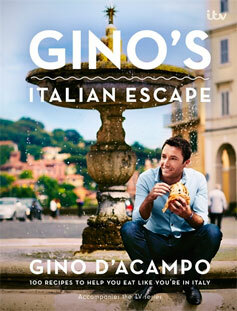 Gino’s Italian Escape, available from amazon.co.uk, priced £13.